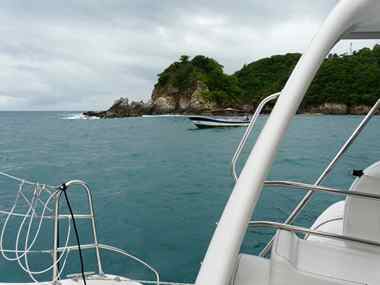 Set off from Acapulco after an amazing visit to the Cliff Diving which more than lived up to the hype. 175 miles none stop after filling the tanks with diesel we left at 10:00 AM. Not much to report other than wind current and everything else you can think off right on the nose making for very slow progress under engines only. Discribed in the guide books as a decent anchorage, we found a tiny pocket rammed with 100 pangas and an underwater canyon absolutely preventing any kind of anchoring. Might have been ideal 15 years ago, but not now. We chugged around for two hours with a noodle soup wishing for a solution. 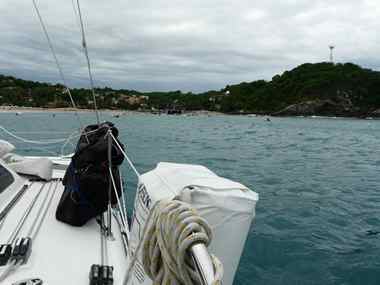 The only conclusion was to head back out at sea for another 10 hours down to the next possible location at Puerto Angel. Awfull weather through the night, big seas, thunderstorms, torrential rain and general exhaustion and misery. Arrived in Puerto Angel next morning at 9:30 AM and dropped anchor in this pretty little cove. Kids went fishing we went for breakfast and a check of the weather forecast indicated worsening weather (if that is possible). Wind now at 19 knots, weather grim, but anchor seems to be holding and surely looks more inviting than out at sea. Anticipating bad weather next two days, and not moving voluntarily till Saturday AM. Puerto Angel seems a lovely little village and I am sure in the sun it must be delightful, however at the moment we cannot leave the boat due to anchor watch. At least we are sheltered, however it has been a slightly grim 3 days and Jasons cabin was turned into an aquarium due to an unsecured hatch which is now all nice smelly and damp. As you can imagine there have been a few terse exchanges of opinion over the last 3 days and Marina Chahue with laundry and dryers lies enticingly close just 25 miles down the coast but unreachable in the weather conditions unfortunately. It is all we can do to hang on in here and re set the anchor every few hours always a good test for any couple whose opinions on anchoring tecnique can differ at times...... Boardman's weather forcasting expertise has also being brought into question by the "almost" revolting crew. 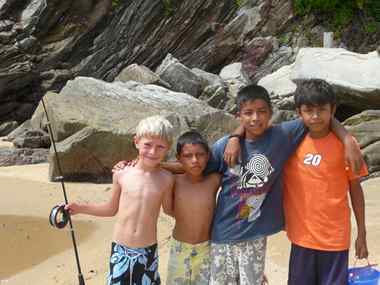 Some pictures of the boys with his new fishing "buddies" yesterday when we had a bit of sun and other pics of the bay without sun today between rain. 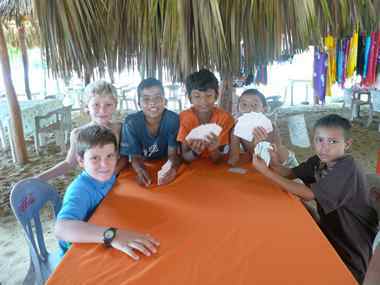 As we speak the fishing fleet are "beaching their boats" due to e bad weather and the playing cards are out. Friday the 13th tomorrow, What can possibly go wrong? Paul and the almost revolting crew.